Toledo Bend Lake is a perfect place to spend the weekend fishing and spending the night in some great Toledo Bend Lake fishing cabins. In addition to fishing, when you stay in a Toledo Bend Lake fishing cabin, you'll find lots of other fun things to see and do in and around Toledo Bend Lake. See the Resource Guide below to learn more. If you're looking for a great cabin for some excellent fishing on Toledo Bend Lake, which was rated one of the Best Bass Fishing Lake in the US, then you need to check out The Big Lake Cabin. This recently renovated two bedroom secluded cabin will sleep up to 9 guests and has a large kitchen and a huge den area with fireplace, pool table, game table, and more. It sits on 20 acres of woods with hiking and biking trails. Two bicycles are provided for you to use during your stay. You can fish off the bank and catch all of the perch you want or bait the trotline from the fishing kayak to catch a couple catfish. Or hop in the fishing kayak or two man canoe and fish the large cove in front of the house to catch yourself some bass. There is a fish cleaning station on the property. A boat ramp is 5 minutes away and there is room for 3 or 4 boats to tie up on the shoreline. They also have a fishing boat available for rent. Fin & Feather Resort is an excellent place to spend a weekend or longer enjoying the resort amenities, Toledo Bend Lake, and nearby activities. They have full hook RV sites if you want to camp and a wide variety of other accommodations including one and two bedroom cabins, hotel rooms, and park models. 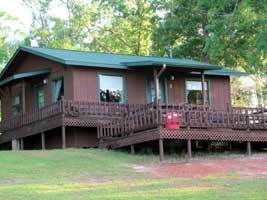 Most of the cabins sit under the trees and on a bluff overlooking the lake. In addition to great accommodations, Fin & Feather Resort has a good restaurant with a sports bar, outside patio overlooking the lake, and pool and shuffleboard tables; a swimming pool; boat ramp and ample trailer parking; game room; lighted and covered fishing pier; guest boat slips; open air pavilion as well as a conference center; a store with the basic staples as well as bait and tackle; and more. Read our Review of Fin & Feather Resort to learn more.